According to the users' feedback, recently Macsome Inc. has upgraded their Macsome iTunes Converter for Mac to Version 2.1.0 on November 08, 2016. After you update your Apple Music Converter to the latest version 2.1.0, the program gives you more stable performances. When you occurs error problems, it supports more detailed log information output. If you are a fresh man to the iTunes Music Converter, don't worry, follow the next quick guide to try to convert your iTunes audio tracks, downloaded Apple Music files, purchased Audiobooks and so on to MP3, WAV, M4A, M4B or FLAC format. Step 1. Free download iTunesConverter.dmg by clicking, install it and then run it. Step 2. Click + button and choose the Music library and add the files you want to convert. Step 3. Click Macsome iTunes Converter Menu, and choose Preferences in the drop-down list, turn to Advance to set the output format. Step 4. 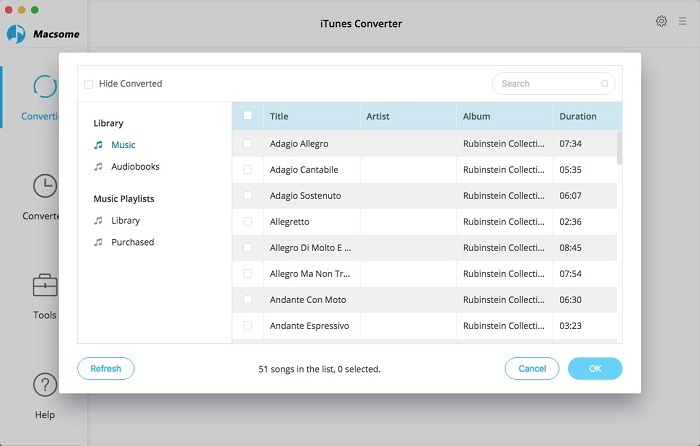 Click CONVERT button to start converting and removing DRM from Apple Music. After the conversion process is finished, you can play the converted Sport MP3 music files anywhere and anytime as you like. Whatever you need it to do for you, it can do this or that for you. Why not go to download and take a try.